Over two days, you will experience mentorship, comradeship, market validation and opportunity assessment tools that allows for deeper insights when marshalling an idea into shape. Be better prepared when communicating the impact of your science ideas for investment, be that Industry or MBIE. You'll work with the very best mentors who are ready to help you get the most of your ideas. Bring a science idea, and watch it soar! GetFunded puts you in an environment to run faster, think harder and bake more into your idea with the support of experienced mentors and a tried and true format built to create results. Short talk, more action. Context for the workshop will be provided by KiwiNet and a guest Case study, pitching support by the expert Daniel Batten, and progress marshalling from dedicated mentors and CreativeHQ. We start bright and early, with an icebreaker event, and then people pitch their research concepts to the crowd. 5-10 concepts will attract viable teams around them. By late on the first night, you will have sketched out your concept in some detail and everyone will have roles assigned and an inkling of how they’re going to achieve their goals over the next 24 hours. You’ll need to start preparing your final 5-minute presentation on Thursday morning, because your team will need to pitch it by dinner time. After that, prizes will be awarded to the best teams. Where you go from there is up to you. The real value is in the skills, new friends, and access to resources you require. Whether you’re a researcher looking for inspiration on how to take your project to investment, an engineer or designer looking for funding, or an entrepreneur looking for a team to turn your idea into reality, GetFUNDED is a fantastic way to test your own abilities and meet great people along the way. What's different about Get FUNDED? This event is focused on research-based ideas, and learn up doing methods to improve the ideas fundable proposition. Everything else is the same fast-paced, awesome and intense experience had by hundreds of motivated researchers, designers and engineers that get involved in every year at Start up weekends. It will be based on a defined body of research that you would aim to be funded through an investor, industry or funding body like Callaghan Innovation, KiwiNet or MBIE. Do I have to have an idea to pitch to join Get FUNDED? No you don't. You can come along and just join a team. Please do! What about intellectual property - how is this protected? We will be given specific instruction on handling intellectual property early on the first morning. Mentors will also be available to discuss IP. Note though, this is an on purpose an open team environment, with attendees from multiple organisations, so come prepared, maybe use your fourth best idea. If worried please speak to your organisation commercialisation managers. What happens after Get FUNDED? There are so many possibilities! Firstly you should memorise the names of your new best friends, and then look at what you have created. Most of all you'll feel richer, smarter and certainly exhausted. 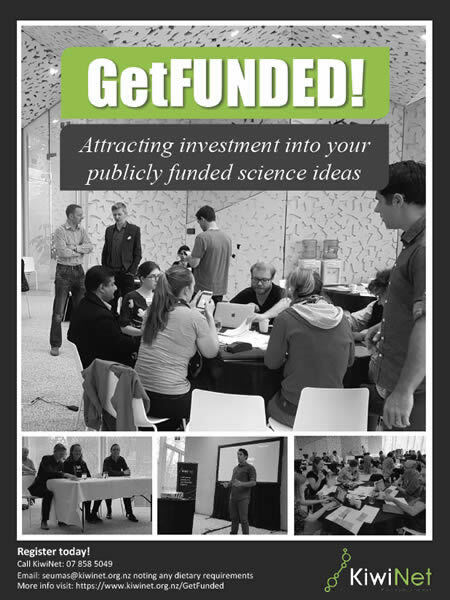 PROPOSED FORMAT FOR GET FUNDED!